During June’1980 a large scale ethnic riots took place in the Tripura state when more then 1300 tribal and non-tribal got killed by each other & large scale arson and damage of properties also took place. Keeping in view of the security scenario in the state, CRPF was initially deployed in the State during later half of 1980s as an aftermath of these riots. CRPF has work hard to restore normalcy in Tripura State. Accordingly, the post of DIG(Ops) Agartala was created on 10/12/1980 vide GOI MHA order No. O.IV-30/80-Estt. (Org) CRPF-(FP-IV) dated 10/12/1980 to exercise operational control and command over CRPF units deployed in the state. 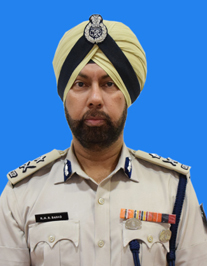 Subsequently, with the expansion of the Force and increase in insurgent activities in the state, one post of IGP(Ops), Tripura was sanctioned vide MHA GOI, order No. O.IV-40/97-Org-PF-IV dated 16/12/1997. Tripura, one of the north-eastern states, is bounded on the north, west, south and southeast by Bangladesh, whereas in the east, it shares a common boundary with Assam and Mizoram.The state has favorable climatic conditions for cultivation of various fruit and horticultural crops. It is rich in natural resources such as natural gas, rubber, tea and medicinal plants. Tripura is endowed with rich and diverse bamboo resources. It is also the second largest natural rubber producer in the country after Kerala and produced 37,277 million tones of rubber in FY 15. Tripura accounts for about 6 per cent of bamboo sticks, used for making incense sticks in India. Around 21 of the 130 bamboo species known in India are grown in the state. Tripura holds a strong tea plantation base, with 58 tea gardens covering an area of over 6,400 hectares in 2014-15. Tea produced in Tripura is famous for its blending qualities. The state is also rich in natural gas deposits, glass sands, limestone, plastic clay and hard rock. As of January 2016, Tripura had a total installed power generation capacity of 676.5 megawatt (MW). With its pleasant climate and scenic landscape, Tripura is a favored tourist destination. The state offers tourists attractions such as historical Hindu and Buddhist sites, temples, rivers and rock carvings. The number of foreign tourists visiting the state grew at a compound annual growth rate (CAGR) of 50.4 per cent from 2010-11 to 2014-15. The state has favorable climatic conditions for cultivating various fruit and horticultural crops including rice, jackfruit, pineapple, potato, sugarcane, chilly and natural rubber. Rice is the major crop of the state and is cultivated in 91 per cent of the cropped area. The state has a wide variety of medical plants having 266 medicinal plants, 379 species of trees, 581 herbs, 320 shrubs and 165 climbers.Tripura has 87.8 per cent literacy rate, higher than the national average rate, making it an ideal destination for knowledge sectors. The Asian Development Bank (ADB) and Government of India signed a loan agreement of US$ 80 million, which is the third tranche of a US$ 200 million financing facility under the North Eastern Region Capital cities Development Investment Program, and will be invested for improving water supply, solid waste management and sanitation in the cities of Agartala and Aizwal, the capital cities of Tripura and Mizoram respectively. The Airports Authority of India (AAI) plans to spend Rs 450 crore (US$ 68 million) on up gradation of Agartala airport in Tripura to international standards, which is expected to be completed by 2016.